Attorney Boris Piekarek specializes in developing wealth management structures (including the selection of appropriate legal forms) for companies, real estate owners and investors, and high net worth individuals. 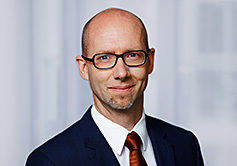 His key competency is optimizing wealth management with respect to all aspects of German real estate law, corporate law, and tax law. The structures are based on an in-depth review and analysis of all relevant private and business risks thereby protecting our clients' often complex asset and income sources while minimizing tax burdens and ensuring continued appreciation and tax compliance. Family foundations and business owner foundations. Another major focus of Attorney Piekarek’s work is providing comprehensive legal and tax support in real estate investments, including the negotiation of real estate sale and purchase agreements. He has successfully advised clients on a wide range of projects involving industrial and retail commercial properties, greenfield projects, , freehold apartments and residential housing. Boris Piekarek studied law at Bayreuth University, Germany. Before joining WINHELLER, he was associated with a Berlin-based firm specializing in tax law, corporate law, and venture capital; and later managed his own law firm. Right after law school, Attorney Piekarek gained his first experiences in international commercial law at a leading international law firm in San Francisco.